Discover interesting facts and information about the Native Indian weapons and tools of the Native Americans. The following articles detail info about the bow and arrows, tomahawk weapons, war club weapons, knife weapons and lance weapons made and used by the men of the tribes. 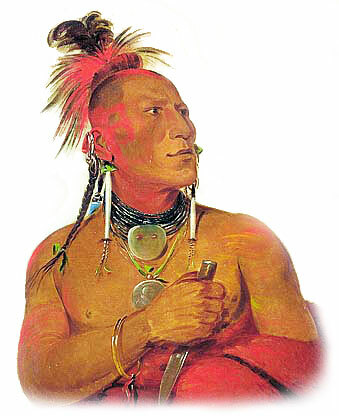 The most iconic war weapons of the Native Indians were the bow and arrow and the tomahawk. The arrow-point was made of of chert, hornstone, or flint. Spears were pointed with similar material. They whittled bows from strong, tough wood and shaped them in a double curve. The Native Americans made arrows with a sharp stone head. The arrows could measure up to two and a half feet long and were feathered, usually from the feathers of eagles or buzzards, which insured accuracy in its flight. 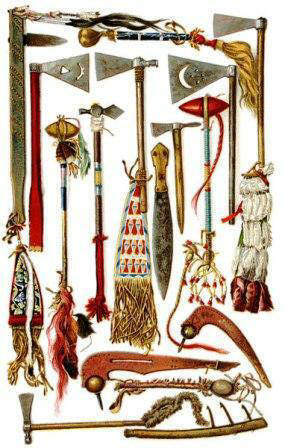 The war-club, of heavy wood, is usually elaborately ornamented with war-eagle feathers and with painted devices. The Plains Indians used war shields made of raw buffalo hide elaborately painted, and decorated with feathers. The shields were either oval or circular in form and about two feet in diameter. The history and details of the Stone Age weapons made and used by American Indians are included in the various articles in this section which provide an opportunity to study the differences between the tribes of Native Americans. Tools included hide scrapers, such as knives or crooked knives. Other tools included hammer stones, utility hammers, mauls and drills. Native Indian tools were made from various raw materials such as wood, stone, bone, antlers. The material used helped determine the method of construction. Some of their tools were hafted, meaning attached, to a wooden handle.